A bacterial infection under the surface of your gums can have far-reaching effects on your overall health. It may be difficult to recognize the symptoms of periodontal disease, also known as gum disease. If not recognized and treated, it can lead to deeper infections in the sockets and jaw bone that secure your teeth. 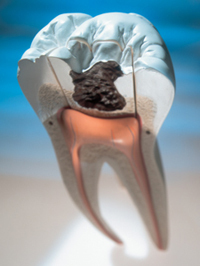 There are two types of periodontal disease: gingivitis and periodontitis. Diagnosed in its early stages, gum disease is easily treatable and reversible. The good news is that gingivitis is easily treatable, especially when caught early. You can save time, money and hassle by having regular checkups to make sure gingivitis doesn’t set in. The treatment options for gingivitis are a cleaning that will rid your mouth of harmful bacteria and antimicrobial therapy, which administers antibacterial medicines in your gums. We can also provide oral antibiotic rinses that can reduce bacterial levels in and around your gum lines. There are three different nonsurgical solutions for treating periodontitis at Choice One Dental Care of Columbus. A professional dental cleaning can remove plaque, stain and tartar along with antimicrobial irrigation to kill bacteria, viruses, fungi and yeast that cause periodontitis. Scaling and root planing is another way that we can stop the progression of any bone loss from periodontitis, lessening your chance of losing a tooth. This procedure is completed while you’re numbed making it comfortable and pain-free. Soothing mouthwashes are provided to speed your healing. A third nonsurgical option for periodontitis involves administering antimicrobial medicines around your gums, along with antibiotic rinses that can be prescribed as needed. In more extreme cases of periodontitis, we can refer you to a periodontist for surgical treatment, collaborating with them to give you the greatest benefit. Are you interested in finding out more about keeping your gums healthy? Contact our friendly team today! Free parking is available for your convenience.